Editor’s note: Baseball is back and Yahoo Sports is previewing all 30 teams over the next month. This year’s previews will focus on fantasy and reality, as our MLB news staff and our fantasy baseball crew come together to assess each team before opening day. Next up, the St. Louis Cardinals. We talk about the Chicago Cubs, we talk about the Milwaukee Brewers — heck, we even talk about the Cincinnati Reds and their interesting offseason. But the St. Louis Cardinals might be the team in the NL Central that can zoom past everyone if things go their way this year. The Cards didn’t sign Bryce Harper or Manny Machado. They didn’t strike a nine-figure deal for a star. They made what could oddly seem like an under-the-radar move at this point, the way the offseason became obsessed with Machado and Harper. St. Louis traded for Paul Goldschmidt and that, more than anything, could wind up being the move that pushed a non-playoff team last year into the postseason this year. 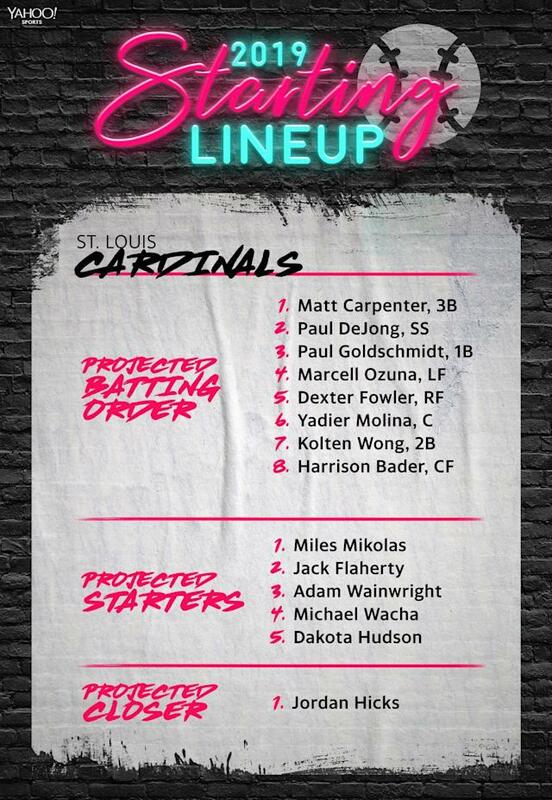 Granted, they need a lot of things to go right, but if Harrison Bader continues to climb, Matt Carpenter keeps going with the good-luck salsa vibes, Marcell Ozuna gets healthy, Dexter Fowler bounces back and the pitching staff comes together, the Cardinals are dangerous. The pitching is an interesting part of this. Miles Mikolas was superb last year and 23-year-old Jack Flaherty showed plenty of promise. Still, a lot rides on them keeping that up in 2019, plus Adam Wainwright having something left in the tank and Michael Wacha making positive contributions. There are question marks in Alex Reyes and Carlos Martinez, again related to health. All those things work out, though, and the Cardinals are a legit contender. On the fantasy end of things, there’s just as much to like. Whether we’re talking about the earlier-round picks like Goldschmidt, Carpenter and Ozuna, or some of the most eyebrow-raising youngsters like Flaherty, Bader, and closer Jordan Hicks. Keep an eye on these Cardinals. The Cardinals did well. It wasn’t a huge overhaul, but rather a continued reshaping of the roster to address some issues. Getting Goldschmidt was huge, especially if they can extend him. They also signed Andrew Miller, who will be an effective weapon if he’s couple-years-ago Andrew Miller. Matt Wieters came aboard as a back-up catcher. Mostly, though, the Cardinals just need good health and their young players to take another step forward. Who will be St. Louis’ fantasy breakout? What is St. Louis’ biggest fantasy question? Remember Alex Reyes? You know, the prospect who was supposed to dominate for the Cardinals in 2017? Well, thanks to Tommy John surgery, he’s still a rookie in 2019. 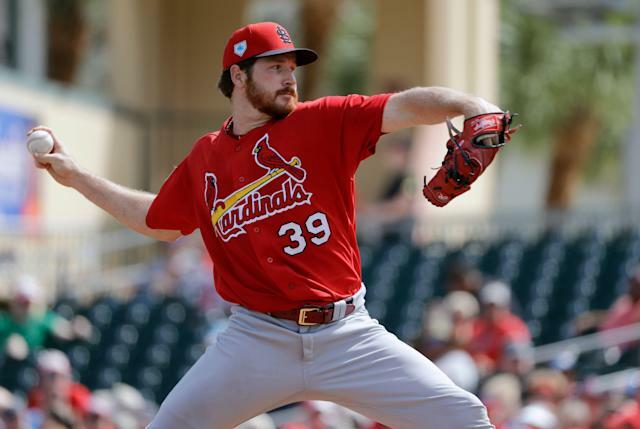 Reyes should play a big role for the Cardinals, but it’s unclear how many innings they’ll let him pitch after he spent much of 2018 recovering from the surgery. 1. Better health: The Cardinals were hit harder than most by injuries last season. Dexter Fowler (foot), Marcell Ozuna (shoulder), Yadier Molina (groin, hamstring), Carlos Martinez (shoulder, lat), Michael Wacha (oblique), Dominic Leone (nerve), Adam Wainwright (elbow) and Luke Gregerson (arm) were all limited to some degree. The Cardinals will need that group to come back strong this season. They're counting on a bounce-back season from Fowler in particular, who's yet to hit his stride in St. Louis. If they keep their core on the field, it will go a long ways toward a successful season. 2. Alex Reyes' comeback: We didn't lump Reyes in with that group because his situation could have short-term and long-term impact. The former top prospect has been limited to four innings in the majors the past two seasons due to shoulder and elbow surgeries. The Cardinals main goal is to get him back to full strength, no matter how long it takes. If there are no setbacks, he could be a major contributor in several potential roles this season. But the most important thing is: No setbacks.